Install the white Floodlight Cam from Ring on the outside of your home to monitor movement and keep an eye on your property. It features two 3000K LED floodlights to illuminate the area when motion is detected via the built-in PIR sensor. Motion triggers the 1080p camera to begin a live stream with a notification sent to your connected iOS or Android device. The camera has a 140° field of view for a wide coverage area, and integrated two-way audio allows you to listen and communicate with visitors via the built-in microphone and speaker. The unit can be used in temperatures as low as -20°F and as high as 120°F, enabling operation in a wide variety of environments, while bank-grade encryption offers safe transfer of data from the camera to your mobile device. The camera features Wi-Fi connectivity for quick setup and live streaming. From the free app you can control the 100 dB siren, lights, and adjust motion detection settings, including detection zones. Cloud recording ensures that you'll never miss any activity happening at your home. 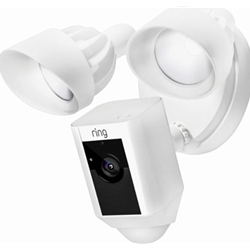 Every Ring Floodlight Cam includes a 30-day free trial of cloud recording. After that, you have an option of subscribing to the service at an additional cost.